How do you find motivation to exercise when you just don't feel like? Most people are aware that they have to workout as it is good for their health, but still face trouble in having enthusiasm for the same. 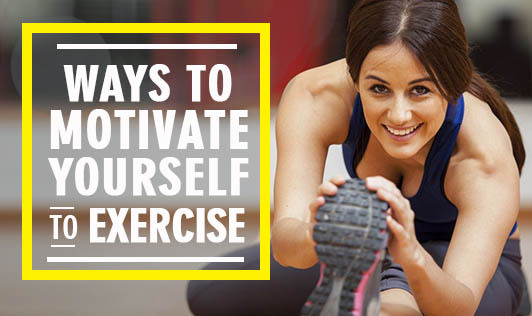 There are a million ways to motivate yourself to exercise. Here are a few motivational exercise tips, which will help you stay active and happy. 1) Do something you enjoy. If you do not like what you are doing, you will not do it often. So find something that you like. Keep experimenting until you find the exercise that motivates you, mentally and physically. 2) Set goals. Be realistic about what you want. You can have short term goals that lead to long term goals. Have a time frame for your goal and be specific while setting exercise goals. They should be obtainable, otherwise you will get de-motivated. 3) Schedule your workout. Prioritize it over others. Plan it in your calendar just like you will do for any meeting or appointment. If you cancel one, reschedule it immediately. Work is important. So is your health. 4) Have a partner. Get a friend to exercise along with you, as this will introduce a positive kind of peer pressure. 5) Reward yourself. When you reach a goal, reward yourself. This will motivate you to set more goals and achieve them. Rewards should not be food related. 6) Chart your progress. Start by getting a fitness assessment when you first begin a program. Write down your weight, body fat measurements, and body mass index. Get these figures checked again after few months to see how much progress you have made. 7) Forget about the all-or-nothing approach. If you don't have an hour, 45 minutes, even 30 minutes of exercise is better than not doing anything. If you can't work out in the morning, evening will do too. So just get back into your routine and stop giving excuses. 8) Keep a count on the calories being burnt while you exercise; it is an effective way to motivate. The more you exercise; the more calories you will burn and the more weight you will lose. 9) Get a professional trainer to guide you while you exercise. Since you have paid for yourself, you will have no choice, but to exercise regularly. The trainer will help you assess your current program and incorporate new strategies to move ahead. 10) Be regular. When you stick to working out regularly, there comes a point where omitting it becomes unthinkable. So make exercising a habit and you won't miss another day of it.